Sanctus meets at TSF every Wednesday night at 6:30PM unless stated other wise. Truth weekend sign ups are available now. Cost is $70 dollars for a student and $40 dollars for a guest! Sanctus Student Ministry is for students currently in 6-12 grade. Sanctus meets Wednesday nights at 6:30 p.m. at TSF. 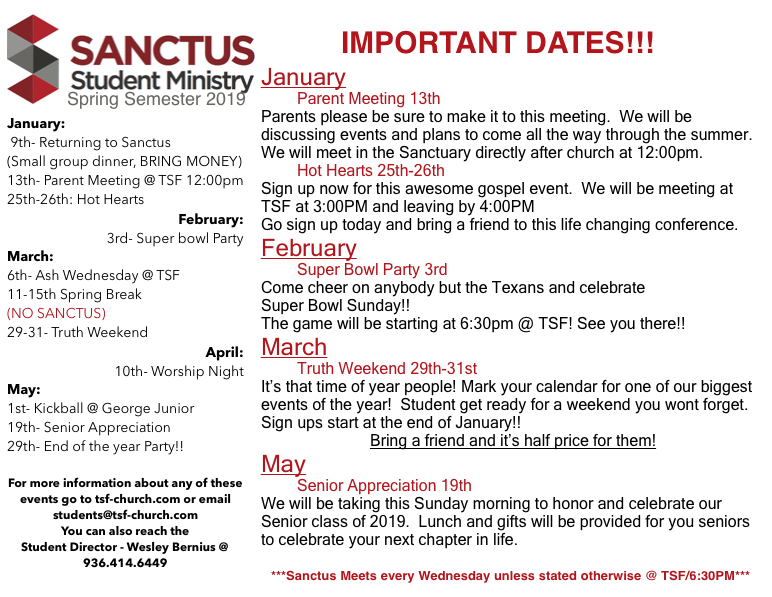 For more information about Sanctus email Wesley at bernius@tsf-church.com. Everything we do will be aimed at helping our students foster a deep love for Jesus. Every event, social gathering, worship service, pizza outing, etc. will have this purpose. My prayer is that our students walk away from our youth ministry knowing that God is real and worth pursuing above all else. Many students who come through our doors have no idea what the Gospel is. The Gospel is the foundation of our faith and needs to be a huge priority for our student ministry. Our students need to know and be reminded constantly that the Gospel is real and has implications for how they live their lives. Every time we are together we need to make sure that the Gospel is being shared, pointed to and talked about. Worship is important to God so it’s important to us! We will model for them what it means to make much of God as the gathered church. It gives students permission to express themselves to God. A lot of times we are at a loss for words when it comes to what’s going on inside of us. The lyrics of the songs we sing help us express ourselves to The Lord. Music is a powerful tool God has given us. We remember lyrics to our favorite songs but struggle to remember what our teachers and pastors talked about 3 weeks prior. We will worship constantly so that the truths of scripture get down into the hearts and minds or our kids. At the end of the day parents are responsible for the spiritual formation of their kids. Our student ministry can’t be seen as something separate from the home life. We will aim to partner with parents; giving them a more active role in this ministry. We are asking parents to help with events, food prep, hosting slumber parties or Sanctus Nights Out, and making themselves available for all manner of ministry. We live in one of the most diverse counties in the country. Our church is located within a mile from two high schools that have a demographic that looks nothing like our church. We will be intentional about getting into our community and growing our youth group in a God-centered, multicultural movement with students from different socio-economic backgrounds. For information about Sanctus Student Ministry please email Pastor Jimmy at jimmy@tsf-church.com.